The Polytechnic engineering students under Laski and Yuki Styles and AuthentiQ Clothing on Friday impressed peers with their designs during a fashion show. AuthentiQ Clothing is a brand that concentrates on designing T-shirts and screen printing while Laski and Yuki Styles design outfits for both male and females using African prints and other mixed prints. Speaking during the fashion show at the college’s cafeteria, AunthentiQ Clothing co-founder Foster Kamudoni Nyasulu said fashion is an expression and people should dress to express themselves. “What you wear defines you. We are here to show you what AuthentiQ Clothing and Laski and Yuki Styles can offer,” he said to an impressive audience dominated by The Polytechnic students. He said as designers, they target a world-class market aiming to compete with big brands such as Nike, Louis Viitton and Addidas. “We started our journey as two distinctly diverse individuals, but now we are together as a pair striving to achieve excellence,” he said. After the introductions, patrons were treated to a number of performances, but it was third-year student, Grena Phiri, who stole the show with a thrilling performance of two gospel songs. The patrons could not resist, but to sing along and dance. Chikumbutso Walani also impressed with his two poems titled Ndabwera and Titchene. “Pomwe tikutchena kunja, tiyeni tikumbukilenso kukonza mkati mwathu,” goes part of the poem Titchene. Then it was the moment of truth when the designs were revealed to the patrons. The immaculately dressed models strutted their stuff on the runway as patrons screamed and cheered in appreciation. 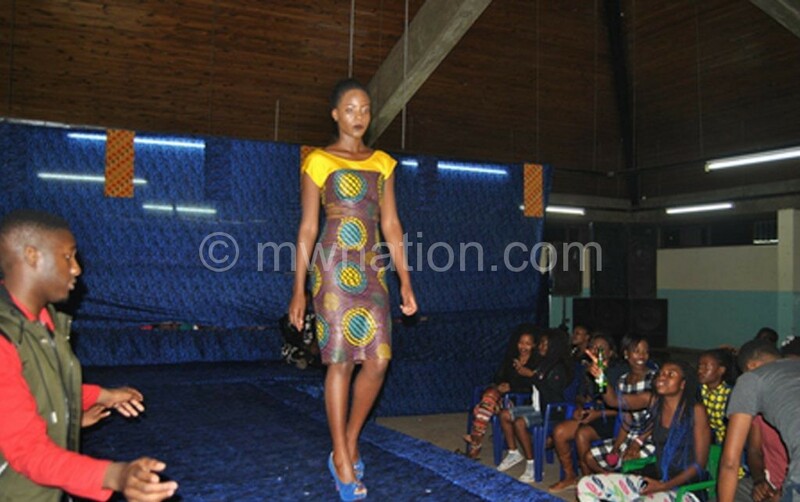 While AunthentiQ Clothing designs mainly showcased T-shirts, Laski and Yuki Styles showcased dresses and shirts mainly from African prints. At the end, the designers thanked the patrons for the turn-up and asked them to complement the gesture by buying the designs.